Since the crafting of this mission statement the museum has broadened its focus considerably. We are concerned not just with the metallic resources that most people think of when they hear the word "mining", but with all commodities taken from the Earth — bulk rock taken from our quarries, sand and clay excavated from surface pits, and oil and gas obtained by drilling. These commodities constitute the raw materials from which almost everything else — our houses, cars, highways and bridges, computers, on and on — are made. As an institution we are neither pro-mining nor anti-mining. Instead, we are a museum about mining, again with that word used in its broadest possible context. 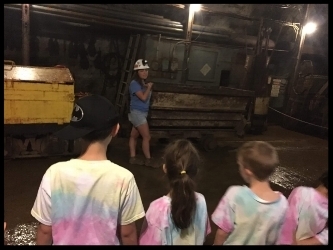 We teach not only how mined materials are produced, but also about the many uses to which mined materials are put, and we place special emphasis on the environmental and societal consequences of resource extraction. Alternatives to mining, such as recycling and the use of alternative materials, are highlighted as well. We inspire students to pursue careers in science and engineering. We inspire people to be thoughtful and responsible stewards of our environment. We are committed to preserve our historic facility, rock and mineral samples, artifacts, and records to support research and foster understanding of this unique geologic area. We provide visually stimulating, hands-on experiences in earth science and technology in an historic, immersive, real-world setting. We promote an understanding of human involvement in our environment and how science and technology relate to that connection.